Tagline: Beyond the horizon lies the secret to a new beginning. 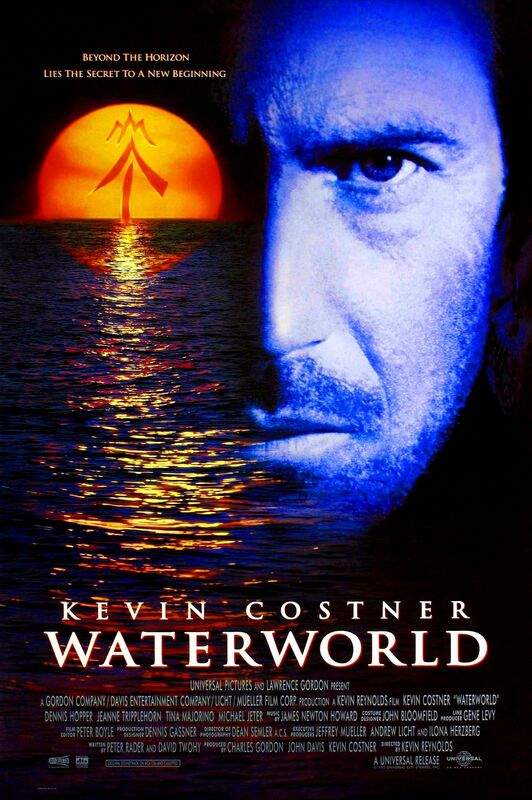 After experiencing huge success with 1991‘s Robin Hood: Prince of Thieves, the director would be handed a budget of $175,000,000 to direct dystopian spectacular Waterworld, and though that sum may seem paltry by today’s standards, at the time it constituted the world’s most expensive movie, a fact made so apparent in the mainstream media that it was almost destined to fail, and in many quarters encouraged to. Inevitably, we were convinced that the movie was a total failure, and Reynolds all but disappeared from the cinematic landscape. So widespread was the ridicule that even The Simpsons—then America’s most popular and respected show—would lampoon its financial shortcomings, Springfield’s perennial loser Millhouse pumping quarter after quarter into a Waterworld arcade machine, only to be instructed to insert more coins after the game’s protagonist took a single step. Costner flees the premiere of Waterworld (circa 1995). 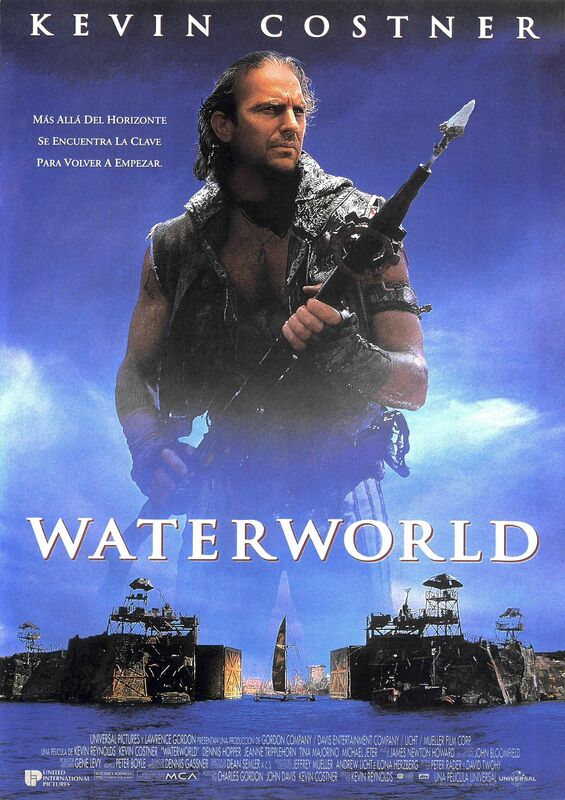 So is Waterworld really as bad as we tend to remember? The short answer is No, but when you realise just how much potential this movie had, you kind of begin to write it off a little. Costner’s punt at action superstardom is largely enjoyable for a multitude of reasons, but it is kind of exhausting and ultimately forgettable due to its inability to offer anything new and refreshing. In a nutshell, this is Mad Max on water. Yes, such comparisons are lazy at best, but it is tough to argue with the similarities. Some of them are frankly unavoidable due to the cultural impact of movies such as The Road Warrior, but other similitudes are just plain derivative. Not only are the costumes and set designs of a dystopian future snipped straight from the Mad Max catalogue, it even steals some of the movie’s gimmicks and plot devices: the power of fuel, the preciousness of rare junk, the unwilling surrogate motif. There is even a goofy sidekick with a flying contraption as a flamboyant tyrant and reluctant hero are left to decide the futures of an oppressed community driven by self-preservation. Is that Mel Gibson? I think it is! Perhaps a lesser referenced influence on the movie, save for some kind of miraculous coincidence, is the science fiction novel The Blue World by Jack Vance, whose floating colonies and internal power struggles are very much reminiscent of the director’s vision, as are the book’s various speculations regarding a society which has learnt to adapt to a water-based planet. There are some neat ideas featured in Waterworld —a homemade filtration system that turns one’s urine into drinkable water perhaps the most memorable—but such novelties are few and far between as the Hollywood machine settles for tried-and-tested. If your recollections of the movie are vague at best, it is the tale of a loner known as The Mariner, a sea scavenger whose body has adapted to a future in which the polar ice caps have melted and land is a distant memory. Emotionally detached as a means for survival, The Mariner is sentenced to death at a giant trading centre after killing a man in self-defence, but when a notorious rabble of pirates known as The Smokers raid the place in search of a young girl, our protagonist is able to escape in the ensuing melee, picking up a couple of unwanted passengers in the process. The Mariner did the best he could with the parts available. One of those passengers is the girl in question, who it is claimed is the recipient of a tattoo that is actually a map to dry land. Unaware of this, The Mariner wants nothing to do with the girl or her impossibly beautiful custodian, Helen (Tripplehorn), and even threatens to throw the young girl overboard in order to save on dwindling rations. The Mariner is a survival machine, an extension of the quite phenomenal sail boat he has somehow constructed, an aerodynamic wonder which proves to be the Lamborghini of the seas and is almost an island in itself. The man with the gills and webbed feet has a very stringent routine, one that has helped to ward off the scattering of miscreants one tends to come across. The woman and her surrogate are unnecessary baggage that our stone cold warrior just can’t wait to dispose of. When a crazy, Irish drifter boards for trade and tries to take advantage of his female passengers, The Mariner steps in, however, and after earning their trust he becomes their reluctant provider, overcoming the proprietorial instincts which one tends to acquire when light on possessions, and even ‘loaning’ his young commuter a prized felt pen as a way to encourage her artistic potential. He also teachers her how to swim, which you would think might come in handy in a world bereft of land. Get my optician on the phone! Costner’s career would also suffer long-term as a result of Waterworld, but in all fairness he does as much as he can with the Mariner character, who looks and acts the part in spite of a coldness that prevents us from really investing in him as a hero. In fact, the whole movie is a little hardhearted for a mainstream action picture that would receive the cultural marketing treatment, and with acts of battery and allusions to child cruelty on the menu, it never quite decides on its preferred tone, while attempts to mythologise our antihero during the rescue finale inevitably fall flat. Dennis Hopper provides dependable support as a typically unhinged tyrant known as Deacon, but just like the movie he is all too familiar, effortlessly regurgitating the kind of role he could play in his sleep. His performance, in particular, is indicative of the film’s complacency, and although glorious set designs and stunt-laden set-pieces prove that much of Waterworld‘s budget was money well spent, by the time we are set for the grand finale you begin to feel just a little fatigued by the plot’s inevitability. On a mission to rescue the bothersome youngster who would inevitably win his heart, The Mariner leaps a hundred feet from Deacon’s base and takes out two Smokers acting as lookout. Stealing one of their jet skies, he then speeds up a conveniently positioned ramp and leaps at a third target, squishing him against a giant pole. With a serious lack of water of the drinkable variety, the ever resourceful Mariner devises a makeshift filtration system that turns his urine to water, an act of symbolic holiness that ensures he will never run out of good piss to drink. Acting cold towards his unwanted passengers, the Mariner loses his temper with inquisitive minor Enola, cutting her off mid-sentence. The Mariner: You talk a lot. Enola: I talk a lot because you don’t talk at all. Technically proficient and often dazzling, Waterworld is actually a lot of fun, and with a few more original sci-fi speculations it may have proven quite the unique spectacle, but in the end it is a derivative pastiche with nothing new to really inspire. In spite of its endless resources and spectacular floating sets, our hero never quite relates on the level of Mel Gibson’s Max, whose legend in the annals of post-apocalyptic cinema proves the ultimate burden.